The Boeing KC-97 was part of the US Air Forces Strategic Air Command. Its versatility as a multi-purpose aircraft allowed it to be used as a troop transport/cargo carrier moving heavy equipment, light tanks, ambulances, artillery or a combination of these. They were also used as a hospital aircraft flying from Japan returning wounded from the Korean War to the USA. The quick convertibility of the KC-97 from freighter to in-air refueller was made possible by the unique packaging of the tanker equipment and flying boom. This particular aircraft was built in 1952 and was delivered to the 306th Bombardment at MacDill Air Force Base, Florida. Over the years it has been deployed to Germany, Morocco, Canada and Lajes in the Azores in support of unit movements and special operations. This aircraft continued its service with a number of Strategic Air Command units before its retirement in 1978. 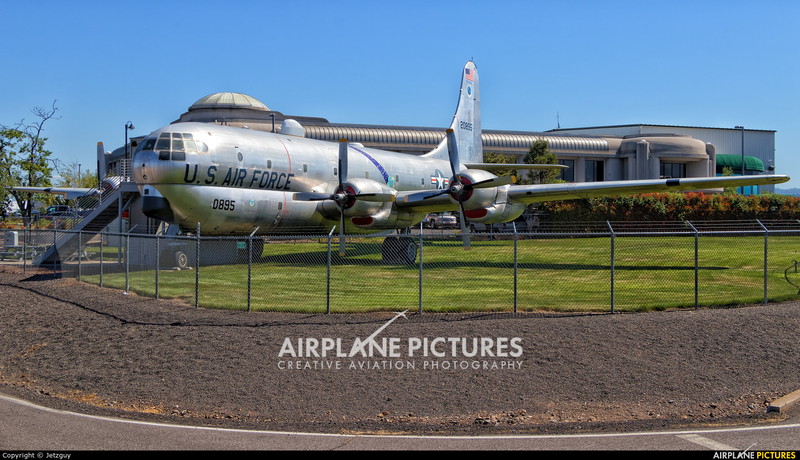 Her final flight was made in November of 1990 to Medford-Rogue Valley International Airport. 811 of these planes were built by Boeing. They were to slow to work well with fast jet attack aircraft and bombers so Boeing built the jet powered KC-135 tanker fleet to still flies today. Sorry for the fence line. I was using a vehicle as a base and standing on a 6 ft ladder to get high enough for this shot. This is the best I could do to get a complete photo of this interesting bird.